A relatively new city by Japan’s standards, Sapporo was founded in 1857. Because of this, Sapporo doesn’t have as many traditional style buildings, but there are still many wonderful things to see and do. Most people get to Sapporo by plane, but the island of Hokkaido is connected to the main island of Honshu by train using the world’s longest underground tunnel. Once in Sapporo, you can take in the sights of the Sapporo Clock Tower, Asahiyama Park (famous for cherry blossoms in the spring and fall foliage), the 100th Anniversary Memorial Park Tower, and the famous Sapporo Beer Museum. There are also plenty of hot springs and places outside the city to enjoy hiking, skiing, snowboarding, and relaxing in nature. 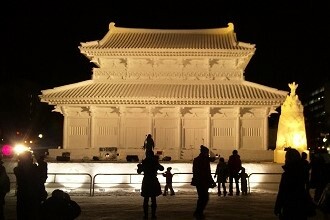 Of course, one of the most famous things to do in Sapporo is to visit the Yuki Matsuri, or Snow Festival. Held annually in February, the Snow Festival includes an ice sculpture competition and many large and complex works of art sculpted from ice and snow. The festival is fun to visit during the day, but don’t miss out on seeing the larger sculptures lit up at night! On most weekends, I attend my regular ballet and Japanese classes. I always go out to dinner with friends and I like to visit new places in and around Tokyo for shopping. My students are a good source of information about things to do on weekends and different events that are going on. They have recommended great restaurants, great shopping, great festivals and great sightseeing spots. My friends and fellow AEON teachers are also very well informed of various activities throughout Japan. Additionally, there are local magazines that are written in English that consistently have lists of events/things to do around the area. I have traveled within Japan and overseas during vacation periods. I had a lot of fun traveling to Singapore, Taiwan and Hong Kong with my friends. If I were not in Asia, I probably would not have had the opportunity to visit those places. During a long vacation period, I traveled around the Izu area. I wanted to go to a place where I was able to relax and eat seafood. Izu was amazing. I was able to enjoy hot springs, spa treatments, walk along the sea and eat lots of delicious fresh seafood. After that trip, I truly felt rejuvenated and ready to take on daily life again.